Hope everyone had a good (and safe) weekend. Knitcircus tech-editor Stephannie and I had a great time at Stitches Midwest. 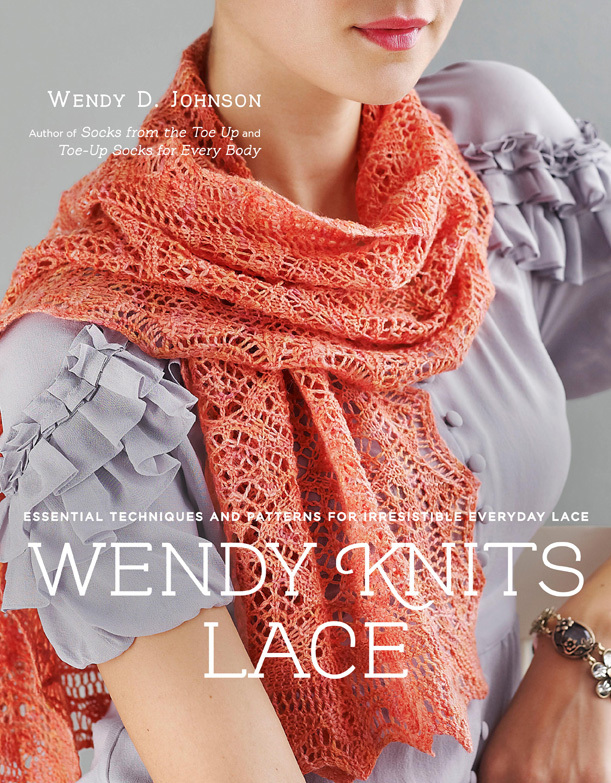 Read on for a chance to win her new book, Wendy Knits Lace! Beloved blogger Wendy Johnson's books Socks from the Toe Up and Toe-Up Socks for Every Body helped fuel the huge surge of interest in constructing socks from the tip, and now she's turned to another of have favorite topics, with her new book, Wendy Knits Lace, a collection of lace patterns meant to be worn everywhere the knitter goes. Wendy's mind easily unravels knitting challenges, and her friendly, approachable style, filled with tips to make knitting more fun, makes this book a must-have for any lace-inclined knitter. The Knitcircus Contributing Editor talked to us about her Everyday Lace collection and love of all things lace; check out her current article, Design Your Own Cowl, for a chance to try your hand at creating a unique and wearable lace cowl ! KC: What draws you to lace? WJ: For me, lace has a high “entertainment factor.” You can create stunning results with surprisingly little effort and at relatively low cost. A completed lace project looks impressive and makes a great gift for non-knitters: they usually think you must be a genius to be able to create lace! KC: Why should knitters not fear charts and possibly making a mistake in the lace pattern? WJ: In my experience, charted lace has fewer errors than lace patterns written out line-by-line. When creating a chart, it is much easier to catch errors because a chart is a much more visual representation of a pattern than a string of knitting abbreviations. If a knitter is used to knitting from written instructions then, yes, there will be a bit of a learning curve when switching to charts. I started knitting before charts were popular and knit everything from written-out instructions. But after learning to use charts, I would never go back. KC: What tips in the book made lace much easier to navigate for you? WJ: Use stitchmarkers, and lots of them! There is no shame in marking out each repeat of your lace pattern with markers. If you are a relatively new knitter you will have far better success seeing each lace repeat separated. You can much more easily troubleshoot errors if you check each repeat after knitting to ensure you have the proper number of stitches and all increases and decreases are in the right places. If you are an experienced lace knitter, markers in your knitting can be a reminder of where you are: you’ve completed a repeat and it’s time to start over. To win a copy of Wendy Knits Lace, please leave a comment here, a comment in teh Knitcircus Ravelry Group or Twitter #kcwendyknits including an email or rav name and your favorite: Wendy Knits pattern OR way to knit socks (toe-up, top-down) OR lace pattern in the fall Knitcircus. Winners will be picked Wednesday, August 31st, sometime before noon.